When Narendra Modi took charge of office in 2014 there was a sudden spat in attack against the Church. The liberals cried foul at once – Christians are under attack in India. That falsehood fell flat in no time. Most of the attacks that our media and liberal elite alike cried for months together turned out to be insider jobs. At one instance even it was found to be the handiwork of a church employee because of some unpaid dues. This is how the narrative our liberals want to build against the present dispensation. They tried their falsehood with Rohith Vemula as well. It turned out that Rohith Vemula wasn’t a ‘Dalit’ to begin with. They roped in Kanheiya Lal and his gang of thieves from the valley to shout on some phoney ‘freedom of expression’ wolf cry. That falsehood failed too. That was some desperate situation for these liberal elites who are nothing but rendered irrelevant and jobless post BJP win in 2014. They somehow need to cling on to something and hope it to stick. What better than bringing up a new narrative – Muslims are under attack in India? There are definitely instances in the recent past where people have got killed in suspicion of being Cow-Traders or as frivolous as consuming beef. This is heinous to say the least. No one should get killed for such absurdities. For me one innocent life lost is one life lost too many. As late as August 2016, the PM himself blasted the so called ‘Gaurakhsaks’ as a threat to not just the civil society but also the Hindu religion itself. Without mincing his words he even referred all such ‘Gaurakhsaks’ as frauds. But the liberal clan seems to have other ideas, and the idea here is not to speak up for those who were lynched mercilessly but to arrest their already half sunken ship. That is perhaps why the latest ‘Not In My Name’ narrative was purely built on untruth and skulduggery. To oppose the so called ‘Muslim Lynching’ (whatever sense that makes) in India the liberal termites held protests in various cities as a show of strength. Not to mention, most of these protest sites were thronged by the usual suspects. And when there is a gathering of these usual suspects eg. the street thugs, the litfest mafias, the ‘Idea Of India’ frauds, the Pakistani sympathizers, the Azaadi gang; lies are expected to fly unobstructed. We will see how this time around the scenario was no different than the earlier ones except for a change that this time the narrative was – ‘Muslims are under attack’ in India. These liberals are so desperate for their survival that they stoop to implausible low. This time they took their shamelessness to the next level. Just to make a point they didn’t even spare our country’s map. This is how these liberals expose themselves every time. In fact the ideologies of these liberals are so shallow that it doesn’t take much time to expose them. 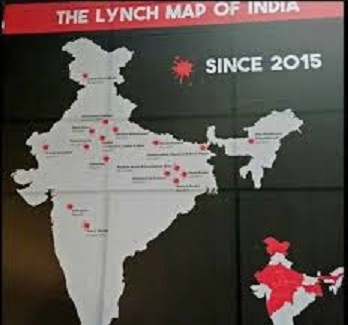 They called it the ‘Lynch Map Of India’. How unbecoming it is on the part of a citizen to refer your national map as a lynch map? But this is how these liberals flourish – by defaming and badmouthing the nation at every given opportunity. This pictorial presentation of our map is a criminal offence too. This is not all. This moronic representation of our map is just part of the falsehood that these liberal termites showcased yesterday. Just look at the blood stains on the map which according to them depicts the location where innocent Muslims were lynched by Hindus. Do you see Srinagar in that map being highlighted where a brave DySP Aayub Pandit was lynched by a Muslim mob? Does this omission appear obvious to you? As I have said many times, these liberal frauds aren’t very bright people. They in fact are stupid to the core but live with a hallucination that no one will pick their stupidity. In the same map there was no mention of the lynching that happened in Bihar either. Why no liberal is talking about this particular lynching where the perpetrators were the ‘Adivasis’? Here it is. 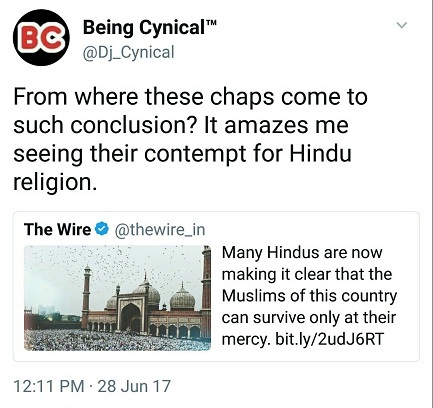 Just about when the liberals were in the verge of an episodic outrage for the Bihar incident, it came to the light that half of those who were lynched are Hindus. What a spoilsport this revelation was, I tell you. Few of these morons even tried, presumably for the first time in their lives, to identify the ‘Adivasis’ as Hindus. But 2-3 Hindus in the victim list spoiled the fun for these liberals hence it finds no place in the so called lynch map of India. This is how these selfsame faggots build their ‘Your Lynching Vs My Lynching’ chronicle and still wonder why they have suddenly become irrelevant in India. Since we are discussing DySP Aayub Pandit’s lynching it should be interesting to note how these same liberals and their fraud outlets tried to cover this particular crime initially. This is NDTV for you, a known culprit in the act of spinning and covering the crimes of Muslim. No wonder that they were telecasting the whole ‘Not In My Name’ farce live. According to them, it was a civilian who got lynched because he brandished a gun. Does it sound like a plot? Only that it misfired badly this time. There was massive outrage in the social media over this false reportage of NDTV. But I wasn’t surprised a bit. 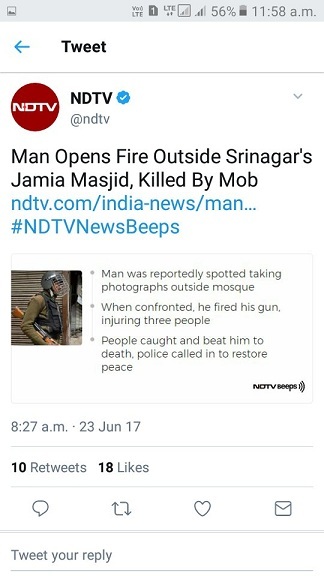 This is how NDTV always operates on their master’s behest. For the entire day, the notorious morons of NDTV were busy defending their clandestine reportage as a mistake but this far from being the truth. It is just that their fabricated lies have become too obvious for the populace to pick. Didn’t I also say our media chaps aren’t bright either? They tried to cover the crime but failed but aren’t brave enough to admit their phoney narrative. They did the same again with the Ballabhgarh train lynching. 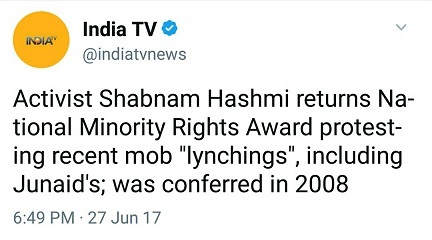 Without any base they claimed the lynching happened because the victims were perceived to be carrying beef. What a monumental lie it was. But truth has this uncanny ability to come out without giving any warning. NDTV was caught with its pant down yet again. This time the father of the victim spilled the beans. When the attack was purely germinated from a dispute regarding the seat the morons in our liberal termite clan tried to give it a communal spin. Lo and behold – these same morons would waste no time in certifying everyone else as communal. Not just the nation, the utter contempt for Hindus in all of this is also palpable. This is what a junk and dubious ‘The Wire’ puts out as fact. This is another kind of ‘Your Lynching Vs My Lynching’ albeit of a more stale nature. But I am not surprised again. Varadabhai is another of those classical morons who have long feasted on the dead and travesty of the citizens. Mindless killings don’t bother him or his notorious clan as much their falsehood does. In one brush he tries to call all Hindus as bad while runs around funny with the phoney ‘Terrorism Has No Religion’ nonsense when the discussion is around the close bonding between terrorism and religion. He is the same joker who never had any reservation in advocating the ‘Hindu Terrorism’ gobbledygook. Just because there is a false notion brewed around the lynching, Varadabhai leaves no opportunity in branding an entire religion as blood thirsty. It even becomes funnier coming from a man whose wife was recently being charge sheeted for conspiring against the state with help from the Naxals. His wife was another from the rascal’s lot who even carry charges for plotting the Chatishgarh killing of our brave CRPF Jawans. These are the kind of people who sermon everyone else on how a nation should be built. Even more irony, they stage bogus protest march to let know their fib louder. I must say, irony should commit suicide at once. I was long wondering, where are the ‘Award Wapsi’ termites in all of this? Just when I thought, there aren’t any more stupid awards left to be returned, there comes Shabnam Hashmi and her never heard award. The award she got for her persistent barking against Modi in 2008 suddenly turned out to be useful for this useful idiot. Before we move ahead, let me remind some facts about this moronic woman. Her NGO was recently declassified and licence was withdrawn for financial violation and money laundering. Now in India, a criminal would give up her never heard award to protest against the so called atrocities against the Muslims. Who would have thought, a day would come when frauds and criminals would preach sainthood? But this is how this termite clan operates. They push their lies thinking no one would pick it but unfortunately people have turned smarter. People are calling the bluff of these morons time-and-again but it still doesn’t instil anything inside the vacuum, criminal and anti-national brains of these scoundrels. They think themselves to be cult above where in they are third rated liars who survive on either free or fraudulent money. People whose whole identity is crawling at the doorsteps of their masters in anticipation of thrown away crumbs/bones would lecture us all on morality. Yet they wonder why most call them jokers. 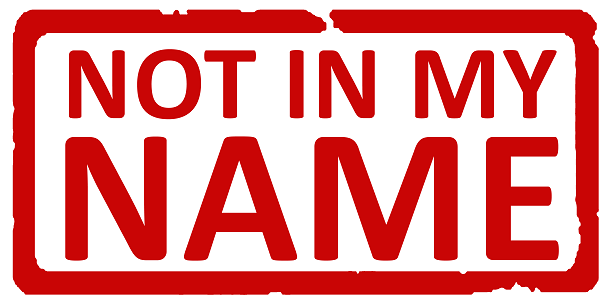 All-in-all this ‘Not In My Name’ farce is yet another self-goal these morons scored. Though it doesn’t take much time in exposing these termites, the morons themselves are working overtime to expose themselves. They expose themselves by their absence in condemning the lynching of many BJP workers in Kerala in recent past. They expose themselves because they go in a hiding whenever the 1984 Sikh riots is popped up. They expose themselves because the try to do political pimping over phone. They expose themselves because they find a lift apt to pounce on a girl of their daughter’s age. They expose themselves because their whole life is based on lies and stupid jamboree which has no place in an honest society. 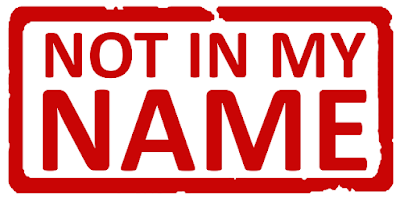 They expose themselves because they are so disconnect with the ground realities. By the way, the morons are far from being over with their deceit and falsehood. The more we approach closer to the 2019 elections shriller these jokers would become with their tone and tenor. It is a survival crisis for these scoundrels and they are bound to go berserk in their act of falsehood. Hope we will keep exposing these scumbags with absolute disdain. Remember – you won’t have to put too much effort to expose these liars.